This year, on the 25th anniversary of Gilbert’s escape from genocide, the foundation hopes to raise enough money in one night to bring clean water to 4,300 more people in Burundi. On April 30th at the Gazelle Foundation’s annual fundraising event Spring For The Water will celebrate 25 years of gratitude for life and clean water with Gilbert Tuhabonye. And recognize several of the key people behind the Gazelle Foundation’s success: philanthropists DK, Mike and Kley Reynolds, will accept the Peter Rauch World Changer Award. Chikage Windler, Chief Meteorologist, CBS Austin will emcee the evening. Ticket includes cocktails, dinner, and award ceremony at the Hyatt-Regency Foothills Ballroom, 6:00 p.m. to 9:30 p.m. You can purchase individual, group and corporate tickets to Spring For The Water. Please consider joining the foundation’s efforts to give clean water to people in Burundi because their survival is in our hands. You can purchase individual, group and corporate tickets to Spring For The Water. For 25 years, Gilbert Tuhabonye has embraced a life of joy and forgiveness. For Gilbert, the burn scars on his body remain a daily reminder of surviving the horrific genocide in 1993. For the people who know him, Gilbert embodies the power of optimism and perseverance. In response to Gilbert’s story, the Gazelle Foundation for the water was created to bring a sense of hope and transformation to the people of Burundi through access to life-saving clean water. To date 49 water systems have been built. 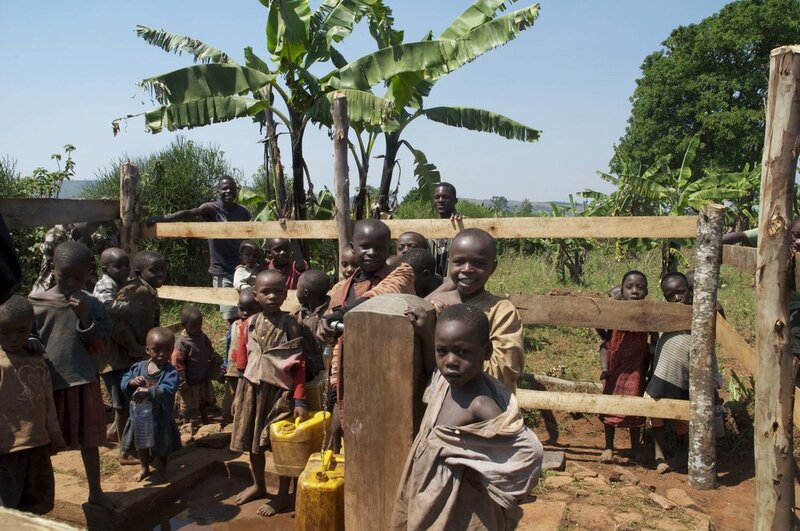 Over 98,000 people in Burundi, Africa now have daily access to clean water. Families in Burundi are healthier, sanitation and hygiene are boosted, and the risk of water-borne infectious diseases are reduced. Rather than spending hours collecting water, kids get more time to attend school. And people can work and earn money. The combination of health, income, and education begin to reverse a cycle of poverty. Access to clean water creates new opportunities and changes the trajectory of every person in the community. The Gazelle Foundation for the water is pleased to announce it has named its highest award the Peter Rauch World Changer Award. Peter Rauch has played an integral role in the Gazelle Foundation For the Water since day one. His tireless commitment to lead the organization to greater heights is one of the many reasons the award will be named in his honor on April 30, 2019 at the Spring For The Water event. The sacrifices of his time and energy would not be possible without the support of his family, his wife Susan and their daughters, Samantha and Allison. Our heartfelt gratitude extends to the entire Rauch family, who have helped change countless lives in Burundi and beyond. Since 2006, thirteen Run For The Water races have been held, 38,400 racers have crossed the finish line. 600+ students have completed Walk For The Water. That has lead to 49 water systems built and over 98,000 people now have daily access to clean water. The Foundation has educated people in central Texas to its cause and the importance of clean water, healthy lifestyles, and philanthropy. Over the years key advisors, supporters and volunteers have been involved, A Board of Directors now exists. Gilbert Tuhabonye is often called the guiding spirit of the Foundation, but it's very clear none of it would exist as it does now without the years of dedication, vision and leadership provided by Peter Rauch. Join us for the first ever Peter Rauch World Changer award ceremony at the Spring For The Water event. You can purchase individual, group and corporate tickets to Spring For The Water. 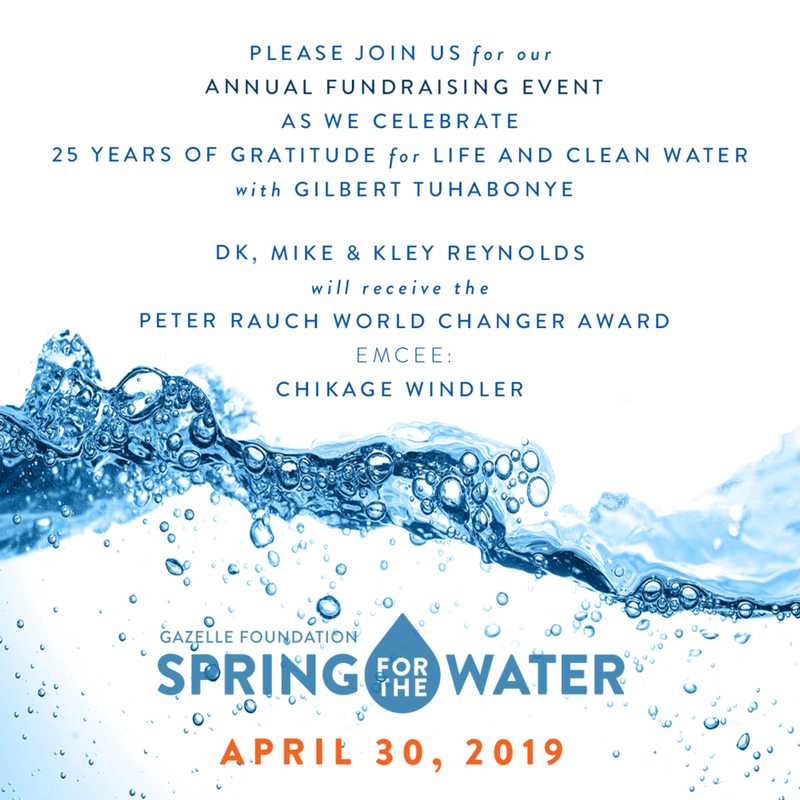 The Gazelle Foundation for the water is pleased to announce that DK, Mike and Kley Reynolds will accept the Peter Rauch World Changer award April 30, 2019 at the Spring For The Water event. DK and Mike Reynolds embraced the initiative of the Foundation since it was conceived. They and hosted pivotal planning meetings at their home where a broad group of individuals identified the name, initial mission, values, and structure. Soon after an initial operational plan was created. DK and Mike joined Peter and Susan Rauch in providing the initial funding allowing the Foundation to incorporate, open a bank account, file for 501(c)3 status and become a living, breathing entity. With no staff or office space, DK, Peter and Gilbert were the original board of directors every subsequent meeting was a combination board meeting, operational team meeting, working group and finance committee meeting rolled into one, soon after others were welcomed onto the board. DK has pressed that the Gazelle Foundation continually mature as a professionally-run charitable organization. And has remained a trusted advisor and steadfast supporter. Through their family foundation, DK and Mike have continued to support the Foundation, greatly enhancing our ability to enlighten people in central Texas to our cause and especially educate young people about the importance of clean water, healthy lifestyles and philanthropy. Run For The Water, and Walk For The Water contribute to carrying out these educational efforts. 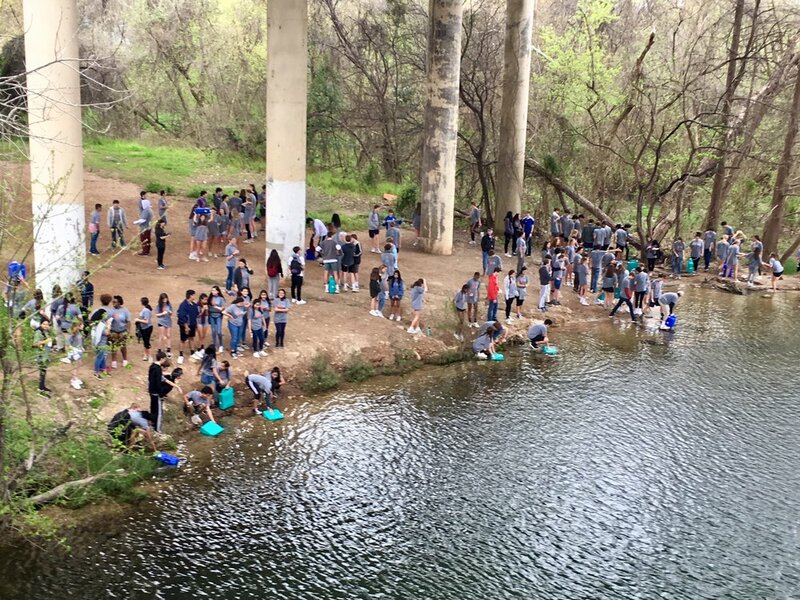 March 2019 nearly 200 students from Global Studies Academy at Austin High School participated in the Walk For The Water program. Where they collect water from Lady Bird Lake then walk carrying jugs weighing up to 40 pounds the three-mile loop to simulate the average weight and distance traveled by people in Burundi Africa. 600+ students have participated in the Walk For The Water program. While Gilbert Tuhabonye and Peter Rauch often get the spotlight and credit for creating the Gazelle Foundation for the Water, it's very clear we would not exist without the impactful presence of many, but most notably DK, Mike and Kley Reynolds. For this reason, their family has been selected as recipients of the first-ever Peter Rauch World Changer Award. Our heartfelt gratitude extends to DK, Mike and Kley Reynolds and their extended family, who have helped change countless lives in Burundi and beyond. Join the Gazelle Foundation for the water at the award ceremony honoring DK, Mike and Kley Reynolds at the Spring For The Water event. You can purchase individual, group and corporate tickets to Spring For The Water. Since 2006, the Gazelle Foundation has focused on bringing clean water and transformative change to Burundi one village at a time. We began in Songa commune and are now moving to the adjacent Matana commune. As a small foundation with strong local support in Austin and grants from corporate sponsors and foundations, we have been able to fund the installation, on average, of five water systems a year. Through Run for the Water, Spring for the Water, Walk for the Water, and the work of the Gazelle Foundation an immediate and lasting impact is made. When we reach out a hand to help faraway people in Burundi, and provide access to water, we change lives, we make history. Please consider joining the foundation’s efforts to give clean water to people in Burundi because their survival is in our hands. The Gazelle Foundation knows it’s not easy changing the world. We thank you our many supporters, volunteers, Board of Directors, Advisors, and staff. We know this is a long-term effort.